The 2009 mitsubishi raider double cab electric vehicle qualifies for a federal tax credit of up to $7,500, effectively reducing the net base price. In a very touchy year for auto makers, Mitsubishi is working hard to reinvent itself by emphasizing performance and specialty cars that hold strong appeal with younger buyers. Still, to compete in today's market a manufacturer must offer a full line of vehicles, including entrants in the lucrative but sometimes fickle truck market. 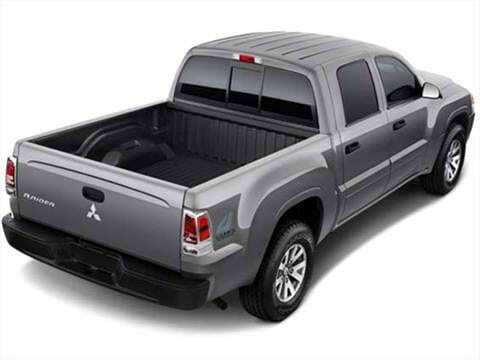 Cashing in on its long-time partnership with Chrysler, Mitsubishi found a quick and inexpensive way to bring their own pick up to market by remolding the popular Dodge Dakota into the 2009 Mitsubishi Raider. Mitsubishi's last truck, the well-respected Mighty Max, was in the lineup until 1997, and the company hopes the Raider will rekindle the same tradition of toughness and strong value. Mitsubishi designed this Raider to be the alternative to SUVs for what the company calls the "fun-seeking adventurer." Though it's not a Lancer Evo, the rock star of the Mitsubishi lineup, the Raider has crisp, muscular lines and a "second look" appeal. The price is also pleasing, starting around $22,000. If you seek a bevy of high-tech creature comforts, you won't find them here. With no V8 engine option, customers may find the 3.7-liter V6 leaves the Raider a bit underpowered. If you're a truck person, the modest 4,150 pounds of towing capacity could be an important consideration. For the 2009 Mitsubishi Raider, a tilt steering wheel is now part of the standard equipment list. The Raider drives exactly as one might suspect – like a mid-sized truck with no bells and whistles. Ride quality is a compromise between full-size pickup truck and passenger car. The V6 performs adequately in around-town driving, but feels short on power when pressed to pass or merge, especially when carrying a full load. We found the suspension, steering, handling and braking were adequate both on- and off-road. On a small off-road course, the Raider maneuvered well and felt sturdy and solid. Although all 2009 Mitsubishi Raiders share basics with the Dodge Dakota, the styling is a bit edgier. The box behind the Extended Cab stretches six feet, six inches, while the Double Cab box is shorter at five feet, three inches. We were impressed by the spacious user-friendly cockpit and especially liked the generous standard equipment of the Double Cab model. There are no outstanding design elements in the interior, but the Raider is, after all, a truck, and function is most important. The wide cabin has an expansive dash with user-friendly controls. A simple, three-gauge cluster has highly readable dials with white backgrounds, and even the base model appointments are brushed metal, a nice touch. Three cup holders in front will expand for a Big Gulp, two 12-volt power outlets are available up front – one in a deep bin between the front seats – and there are reading lights front and back. On the downside, we heard complaints about the small glove box and the unappealing headliner cloth. The 2009 Mitsubishi Raider's styling takes tips from the Mitsubishi family – including the Endeavor SUV and the sporty Eclipse coupe. The Raider pickup may be relatively new, but its legacy is decades old. Its dynamic, carved physique is defined by muscular curves, flared wheel arches and step-side style fenders and high-tech head lamps and tail lamps. A thin upper grille and thick lower bumper give the Raider a square-jawed face that's shared with other Mitsubishi models. The 2009 Raider line includes one Extended Cab and two Double Cab models. The Extended Cab features a 3.7-liter V6, six-speed manual transmission, 16-inch steel wheels, 40/20/40-split cloth bench seat, air conditioning, tilt steering wheel, and an AM/FM/CD/MP3 player with four speakers. The Double Cab adds a four-speed automatic transmission, power mirrors, locks and windows, 60/40-split rear fold-down seatbacks, tilt steering wheel, cruise control, fog lamps and a sliding rear window. Options are limited mostly to the Extended Cab, which can be outfitted with power windows, mirrors and locks, cruise control and fog lights. Both models offer a number of protective features, including scuff plates, bed protectors and side steps. Only the Double Cab offers the option of four-wheel drive. The 2009 Mitsubishi Raider is available with only one engine choice: A 3.7-liter V6. The V6 is available with either a six-speed manual (Extended Cab) or four-speed automatic. Four-wheel drive is offered only with the automatic transmission. The 2009 Mitsubishi Raider LS Extended Cab's Manufacturer's Suggested Retail Price (MSRP) starts around $22,000, while the Double Cab starts closer to $27,000. Four-wheel drive adds another $3,000 to the Double Cab's bottom line. As always, be sure to shop and compare using current Fair Purchase Prices, which reflect real-world selling prices. In terms of resale value (an important factor to consider when comparing vehicles), we expect the Raider to hold value on par with its domestic Dakota twin but fall far short of the residual value of the Toyota Tacoma. Great truck, worth the price.